Mia’s world was unfolding. Her daughter Fortune was missing. She had just learned her husband had been unfaithful multiple times and they were cold stone broke. Eric had lost all their money. FBI Agents were everywhere – taking control of her home. She and Eric had to take a lie detector test. As if they would ever harm their precious Fortune. Mia was literally falling apart and her husband wasn’t helping . Dr. Angela Vincent, Fortune’s doctor, had come to help Mia. Mia was learning things about her daughter she had never heard before. Why was Dr. Vincent saying she was a ‘medical miracle’ saving other children’s lives and must be found safe and unharmed. She even had Fortune’s fingerprints. Why! Mia received a letter from Fortune stating she was on an adventure, having fun with her new friend and would return home soon. This, at least, gave Mia hope. But as time passed, without any new leads, the FBI were pulling out, but would keep the case open. Mia took matters in her own hands. She would hire a Private Investigator and find her daughter. She soon learns information about her marriage and the adoption of her daughter that sent Mia reeling. Dr. Angela Vincent is not the person she appears to be. She is hiding something. Records reveal she has been deceased long before Fortune was born. How can this be as she has been Fortune’s doctor for years. After ten days, Fortune is home – safe and unharmed. She has had a wonderful adventure, has much to tell her parents, and lots and lots of pictures. She has a new friend she calls her ‘first daddy’ . She also has a new family. Everything had changed for Mia, but she was actually happy. She had gotten her daughter back. She had found her FORTUNE!! AJ has done it again. 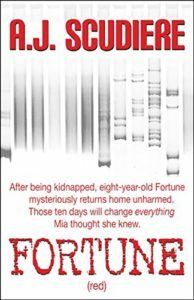 Fortune Gray and Fortune Red are two intriguing, well written books that tell a story of heartaches, betrayal and a parent’s love for their child. 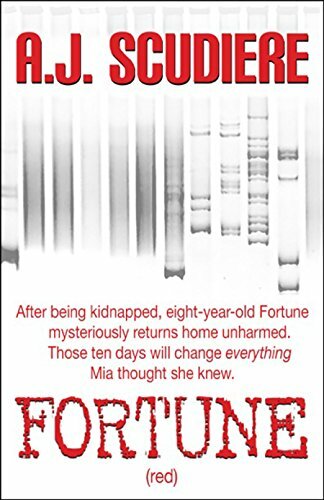 I recommend you read Fortune Gray first. I highly recommend both books to all readers. You will throughly enjoy them as I did.